Sega Is Selling a New Dreamcast Controller. It's a Cute Backpack. In an effort to appeal to hip Japanese teens (I think? ), Sega is rolling out a Dreamcast controller...backpack. This, according to Japanese game site Gamer, is part of Sega's new brand, "SegaKawaii". In Japanese, "kawaii" (かわいい) means "cute" or "adorable". 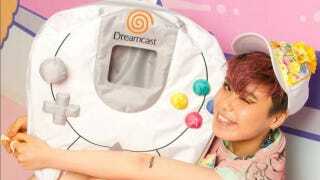 The Dreamcast controller backpack is priced at 13,860円 (US$146) and is going on sale April 25. Other SegaKawaii items are launching the same day, including a Dreamcast t-shirt and a Genesis tank top. What isn't being released is the hope Sega will ever make home consoles again.